The sequel, The Pink Victorian, is now available at Amazon!! The Pink Victorian, sequel to Crossroads Serenade, is now available as an eBook on Amazon! My brother, who takes care of the technical aspects of my books, like layout and publishing, finished this project up a few days ago. I’m lucky to have artists and writers in the family, and I am glad they want to be involved in the proofreading, publishing, and cover work. (Here I do want to also say that there were some people outside the family who also helped me a great deal with my books.) Actually, the cover of Crossroads Serenade was not done by family. I love it, but it does not seem to reflect the content as closely as I would like it to. I have found another cover that I think is more appropriate, so that cover will be changed. 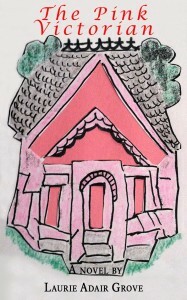 The cover for The Pink Victorian began with a little woodblock print my mother made when I was a child, which my granddaughter interpreted in a new, different light. It looks great on the book! In The Pink Victorian, the town of Crossroads loses some treasured friends, but new people arrive and begin telling their own stories while learning where they fit in with the regulars. There are many events that keep the book moving swiftly along—like when an intruder from Pete’s past shows up for a show-down, which could either drive a permanent wedge into his relationship with Meredith, or cement it in place so they can build their future together. Their future, of course, would include eight-year-old Grant, and Meredith and Pete’s hope that he will stay the happy, well-adjusted boy he is, even after they saddle him with a reality no child should ever have to deal with. The Serenade’s financial guru, Mr. Overgaard, hopes Meredith will realize that a blend of new and old lumber—even lumber from a ghost town, could blend beautifully in a new hotel—if she could only reconcile with what happened to The Serenade’s original hotel and accept that it’s time to move on. Mona, The Serenade’s flirty fifty-something head waitress who took Meredith under her wing and taught her “Waitressing 101”, is finding retirement to be so boring it’s killing her! With JoLynn now the head waitress, it looks like Mona’s going to be stuck in a lifestyle that is so not Mona! 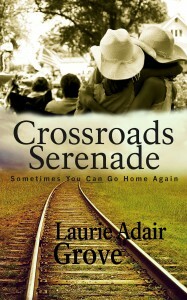 Former Serenade employee Ralph has returned to Crossroads and now works at the McBride’s ranch. A bad experience has left him afraid to love again until he meets Helene, who has a voice like an angel. But Helene and her loving, spirited little girl, Arlee, are on the run from Arlee’s father, and when the gas gauge of their car lands on empty, she and Arlee land in Crossroads and change a lot of lives, including their own. You’ll also see that the children’s charity Jenny dreamed of has come to fruition, filling a need to serve the underprivileged children of the area. Over time, the truth takes hold in Meredith’s heart—that the good the charity does for the children far outweighs any negative memories she has of growing up there, in The Pink Victorian. Get The Pink Victorian at Amazon: $3.15.